Replies: 13 (Who? ), Viewed: 18885 times. Old versions have been removed from this post because, well, trust me you WANT that new search feature! The Interaction class in the 1.44.77 Tdesc has some invalid history data that would throw an exception. The invalid data is now thrown out. Changing the Tdesc root folder has moved to a settings menu. New setting to en/disable the auto-expand nodes when there are new items in a class. Default is disabled. v0.4 note: Had the "follow MUID" feature working for a while but hoped to get the chance to add the ability to search for any tuning by name. Hadn't gotten the chance yet, so figured I'd throw out this as the old MUID link can be useful - this version adds a link to the detail window of anything with a kRename version tag to search backwards through the versions for the old MUID and open that up in a new window. When the program is first launched it will ask you to locate your root tuning folder where the versions are stored. This value is remembered, but may be changed in the future from the File menu. Added some highlighting to the file browser, categories with new tuning description files are highlighted in yellow and the new files are highlighted in green. The split between the file and tuning browsers in the main window can be adjusted. Closing the main browser window will no longer exit the program if another browser window is open. Closing a browser window will also close the associated detail window if one is open. File->Exit wlll warn you if multiple windows are open. Also fixed an exception that would get thrown on exit sometimes if multiple windows were open. Corrupt version history entries (e.g. Client_Tutorial.tdesc) are ignored. The tuning descriptions from the Tuning category folder can now be loaded. The details window now has clickable help links (off by default) for several terms. The majority of the help info was taken straight from the Custom Content Guide. If a tuning has "parents" they will be clickable links that open a new browser window to that tuning. For example, an AdoptionInteraction has parents of SuperInteraction and Interaction. Clicking either of these will open a new window straight that that tuning description file. The old MUID for a renamed tuning node is now presented in the detail window. It's not clickable yet. The "pretty" display name for a tuning node is now used for the detail window title bar. That's what it's there for, I guess! I abanoned the idea of a single "previous version" folder selection. Instead it loads up all previous version folders. Added a Window -> New menu to open a second (third, however many you need I guess) window. Each open window can have a different node selected and will have it's own detail window. 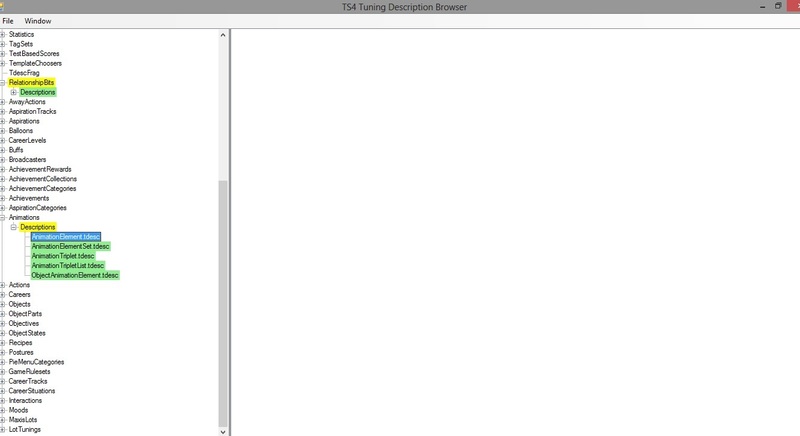 I did notice that at least one of the Tdesc files (Client_Tutorial.tdesc) will cause an exception. Haven't looked into why yet. You should be able to just click the "Continue" button to ignore it, but you can't browse that file obviously. Creates a browsable tree of the tuning description information that EA provides. Automatically expand and highlight any nodes that are marked as "kRename" in the Tdesc VersionHistory. This is a work-in-progress -- EXPECT THERE TO BE BUGS. Cool! Yes, I believe this would be useful -- I do get by by searching the whole folder, but your kind of detail view is a lot easier to parse than that. I too think it could be useful. Well, since some folks are interested I went ahead and posted version 0.1. I think there's a lot of room for improvement, but still pretty useful as is. I've just tried it and it does make things easier, thank you. Worked a bit more on this tonight, but nothing to upload. Did figure out the reason the client_tutorial tuning description wouldn't load - the version history in that file is mangled. None of the files in the tuning folder would load either. Both bugs will be fixed in the next version. #7 19th May 2015 at 6:56 AM Last edited by scumbumbo : 19th May 2015 at 8:42 AM. As the main post states, I think this is almost done. The only real feature I'm itching to add is to be able to click on the old_muid to lookup an old version of a tuning. If anyone has any (reasonable) ideas for other features to add, let me know -- and no, I'm not writing a complete mod generator or anything. That would be real work! ETA: Oh yeah, searches would be nice. I keep forgetting that for some reason! Nice job! I was working on something similar, but not quite the same. It's a plugin for the Atom text editor that shows the documentation from the TDESCs in the sidebar and updates as you move your cursor around. A demo would probably show that better: demo screencast. I haven't posted it yet because it's not very optimized and it's still rough around the edges, but maybe that would be useful in conjunction with this program? One thing I noticed: it doesn't do inheritance, so it only shows the tuning descriptions for the current instance. I can see how that could be useful, since the UI would get very cluttered if it showed the value types from all the parent instances, but maybe there could be toggle to show/hide those? Or at least a list of links so you could jump directly to a parent instance. @Aren - your plugin looks awesome and will definitely be extremely useful for folks editing existing XML (which is typically the case anyway). The inheritance links you mentioned are in the browser - you'll see them if you click on the root XML node of the instance, where the "parents" are listed (see screenshot). The link will open up a new window and go straight to that new instance. Whoops, I didn't see that. I must've been looking for them in the main window instead. That makes sense though, thanks! If I do get around to finishing this by adding the search by name feature, it will likely be a while. See the original post for the version that adds a link to follow the old MUID for referencing renamed tunings. Added the source in as well in case someone wants it. It's pretty bad, lol - typical "I need a feature, how can I hack this in?" style code rinsed and repeated several times. Really needs a complete rewrite, but may be useful for anyone that wants to add features, clone the code or whatever. For some reasons it doesn't open any files for me. Updated the tool, there's some little enhancements I've thrown into it mostly under the hood things no one would notice. The first post of the thread has some more information on those changes. The big reason was the bugfix for the Interaction class invalid history info which would throw an exception.